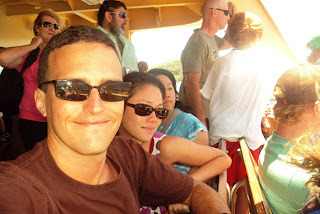 Yesterday we took the ferry to Manly and walked around the town there and took a little stroll along the beach. 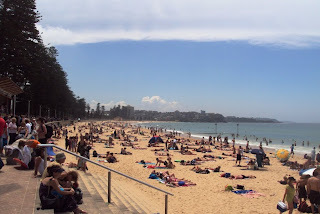 If Bondi Beach reminded me of Miami and/or Venice, California, then Manly seemed a lot like Lake Tahoe. I guess it could have just been the palm trees along the beach that provide a wind barrier, but there was also a feeling of seclusion and a certain chill factor that gave the place a mountain-getaway sort of vibe. Afterwards we headed to the Target in downtown Sydney, which is a pretty far hike from Circular Quay where the ferry dropped us off. I needed to return something to Target (long story). During the walk back to the bus stop, I noticed a familiar face out of the corner of my eye, and lo and behold, it was RPCV Christian from group 78. He'd sent out an email saying he was finally heading back to The States via Sydney this week, and though I'd emailed him about meeting up, he hadn't replied. So it was pure coincidence we ran into each other in from of Sydney's Town Hall. RPCV is Returned Peace Corps Volunteer, a title I've bestowed on Christian because he's left Samoa, but he technically hasn't R-ed yet. When he left Samoa back in September, he came straight to Australia where he's been working on getting his certification as a SCUBA Dive Master. In any case, Christian was with his Dutch friend Mary when we ran into them, and since no one had anything better we went out for dinner and drinks. 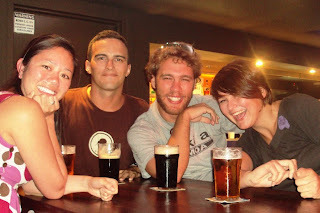 That was last night, and since Christian flies out tomorrow, we met up with him and Mary again tonight for more dinner and drinks. Other than that, today was relatively uneventful. We caught a couple reruns of "The Wonder Years", "ALF", and "Northern Exposure," which was fantastic. And I took a bath. Apologies for not posting yesterday, but we got home late. I hope you're well. Pictures below. 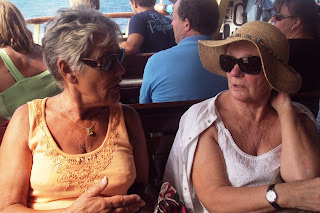 On the ferry back from Manly, I sat across from these two ladies. Several times, my legs rubbed against the legs of the lady on the left. She was entertained and made some suggestive... ummm... suggestions. I think the other lady was embarrassed, but me and orange lady thought the whole thing was hilarious. 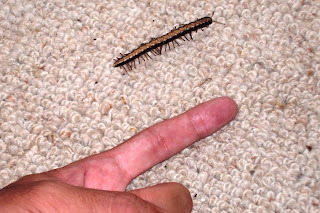 This centipede(?) was hanging out at the bottom of the stairs tonight. Wow, it's a small world indeed! !